What is a Bit Seat, Why Might My Horse Need One and How are Bit Seats Created? When a horse chews at the bit, tosses its head, lips at the reins, roots or otherwise tries to evade the bit, it may mean it is experiencing some discomfort. While back problems are a common cause of misbehavior, discomfort in at horse’s mouth may also cause it to act out. Impacted teeth, a poorly fitting bit, or extra teeth that grow on the bars of the mouth can make it difficult for a horse to hold a bit. Horses with small mouths may have trouble holding thick bits. And, if there are extra teeth in the way, like tushes or wolf teeth, a horse can become very uncomfortable. Before trying a more severe bit, putting on a noseband that will hold the horse’s mouth closed, or other forms of restricting the horse so it behaves, it’s wise to check if dental problems are causing the misbehavior. This means checking carefully in the horse’s mouth yourself. If you suspect a problem you’ll want an equine dentist to check your horse’s mouth. Occasionally, in young horses, impacted teeth when a baby tooth doesn’t shed properly can cause a problem or in slightly older horses, those extra teeth some horses grow can be the culprit. If extra teeth are causing your horse grief, and the horse is having problems holding the bit, an equine dentist may create a bit seat to help the horse be more comfortable. When the bit sits in the horse's mouth, it sits across a toothless span of gums called the bars of the mouth, just in front of the back teeth. Ideally, the bit does not meet any teeth here. But when there are extra teeth, when the reins are pulled back, a small fold of cheek flesh can get trapped between the mouthpiece of the bit and the first back tooth. The painful pinching may result in the horse trying to avoid the pressure of the bit and cause several unwanted behaviors, like head tossing. To prevent this, an equine dentist or a veterinarian will round down the edges of the first upper and lower back tooth that are closest to the bit so there no sharp edges, thus creating what is called a bit seat. To create the bit seat, your horse may have to be sedated. The dentist or veterinarian will open its jaw with a device called a speculum, so they can reach into the mouth easily. With either a power tool or a hand float, the practitioner will round down any sharp edges on the first tooth of the back molars, and bevel it down so there is a little more room for the bit, and the cheek flesh will not catch. Creating a bit seat is not painful for the horse, and may provide almost immediate relief from any discomfort from pinching. Your practitioner may also check the rest of the horse's teeth for sharp edges or hooks that can cause the horse to scrape its cheek or have problems chewing or holding a bit. With a properly fitted and adjusted bit, the check flesh should no longer get caught and cause discomfort. Regular dental care is essential for your horse. 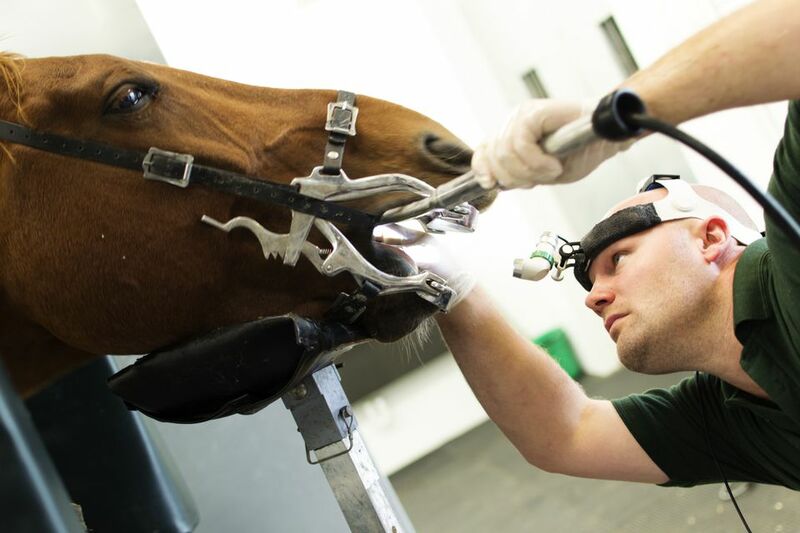 Plan to have your horse’s teeth checked at least once per year.